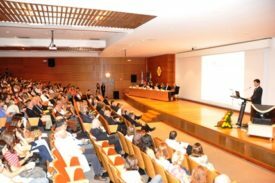 The Formal Commemorations to celebrate the Day of the Faculty of Medicine, University of Lisbon took place on 19th September at the Grand Auditorium of the Egas Moniz Building. This ceremony also marked the 100th anniversary of the Students Association of the Faculty of Medicine, University of Lisbon, as well as the 25th anniversary of GAPIC (the Support Bureau for Scientific and Technological Research and Innovation). The session was very well attended and the 400-seater auditorium was practically full, as a cross section of FMUL’s populace from students, teaching and non-teaching staff to physicians were present at the event. Tomás Silva, President of AEFML (Faculty of Medicine Students Association) opened the session speaking about the path this 100-year-old association has followed, stressing how it has always maintained close collaboration with the Directorate of the Faculty. He also spoke of expectations for the future at the present time when change is constant and uncertainties are great. Then Professor Miguel Oliveira da Silva, the President of the Pedagogical Council, introduced the first year students who took their Hippocatric Oath. an exciting moment for all those beginning this six-year journey at this medical school. 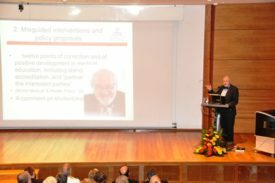 This was followed by the Wellcome Address, Prof. J. Fernandes e Fernandes, Professor Fernandes e Fernandes reminded those attending that this day is “a time when the Faculty looks at itself, reflecting on what has been done. It is also a time to welcome new students, who represent continuity; honour graduates, especially those who graduated 50 years ago because they are an example to all, and those who continue their academic careers either in this faculty or in other institutions”. The Keynote Speaker for the ceremony was Professor David Gordon, President Elect of the European Federation for Medical Education. Professor Gordon spoke about the European medical schools, their evolution and importance for society. This Commencement Address was followed by tributes to retiring Professors, new Full Professors, new Associate Professors, new Professors with Aggregation and new PhD Graduates. Physicians who graduated 50 years before and employees (both teaching and non-teaching staff) celebrating 25 years of service were also honoured. During his speech, the Chancellor of the University of Lisbon, Professor A. Cruz Serra proposed that a new vision and framework for Higher Education and Universities is necessary today. The Choir of the FMUL Students Association ended the first part of the ceremony. Prof. João Ferreira, Coordinator of GAPIC, began the second part of the ceremony with the address “Teaching and Research in FMUL”. He spoke about the 25 years of the Support Bureau for Scientific and Technological Research and Innovation at FMUL. “The Student Perspective” was the topic presented by the student Artur Martins Nixon. These speeches were followed by a roundtable entitled “The Research Institutes at FMUL”, chaired by Professors Miguel Castanho and M. Carmo Fonseca. The participants on the roundtable were Prof. Maria Mota, from the Institute of Molecular Medicine, Prof.ª Fátima Reis from the Institute of Environmental Health, eand Dr. Ana Almeida, from Cardiovascular Center, all at the University of Lisbon. Prof. David Gordon concluded the discussion. The ceremony ended with a performance by members of the University of Lisbon Orchestra.